Ever since its first North American release, it seemed as though Fire Emblem was here to stay. Characters continued to be added to the Super Smash Bros. games, and new titles kept coming out. The non-release of Fire Emblem: Shin MonshÅ no Nazo: Hikari to Kage no EiyÅ« outside of Japan was something of a wake up call that the franchise consists of niche titles that, if no one buys them, will not be coming here any longer. 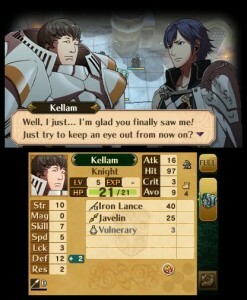 Nothing drove that fact home more than the accidental announcement of Fire Emblem: Awakening‘s localization at E3 2012. If the game is so unimportant to Nintendo that they would forget to give it a formal announcement, their forecast for its success must be absurdly low. Fast forward to today. 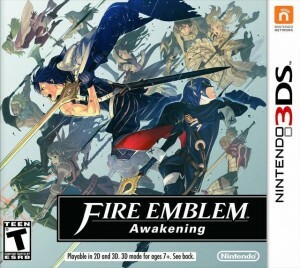 Shipping delays caused the retail release of Fire Emblem: Awakening to become a hot commodity in the days following its launch. Further, retailers who did get copies of the game didn’t even receive enough to cover pre-orders. 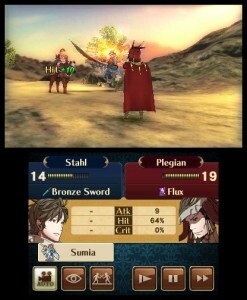 If that’s not enough, you can buy a Fire Emblem themed 3DS and purchase the DLC brought over from Japan. What’s going on, Nintendo? Regardless, the game is in my hands now and all is right in the world. Not just because it’s a Fire Emblem title either, but rather, it’s quite possibly the best Fire Emblem yet. Not convinced? Read on. 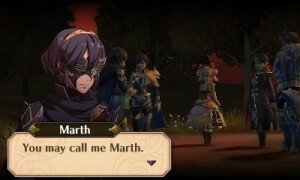 The opening of Fire Emblem: Awakening has all the trappings of a cliche-ridden JRPG. Main character with amnesia? Check. Innocent villages being burned down by bandits? Check. An unknown evil that threatens to destroy the world? Check. Yet the game masterfully takes all of these elements and spins them into a narrative that will keep you glued to the game until well beyond its conclusion. The gameplay certainly aids in that (which I’ll get to in a minute), but the character interaction is where things truly shine. Speaking of characters, for the first time outside of Japan, you’ll be tasked with creating an avatar to represent yourself within the game. You can choose to be male or female, with a limited selection of facial appearances and voices. While I would’ve enjoyed more diversity in character customization, the way they set the game up would’ve required the artists to draw portraits for every single potential combination, which I could see as being problematic. Even so, the fact that you can do it at all is neat, and they manage to work it into the narrative convincingly. 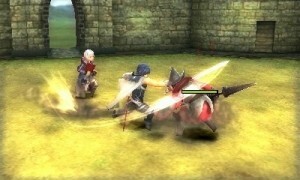 Your avatar is found in a field by a man named Chrom and his group, known as Shepherds. He/she knows nothing other than Chrom’s name, and despite the suspicious nature of the situation, Chrom agrees to bring your avatar along anyway. Things go south as a nearby village is attacked and your avatar discovers that, not only are they capable of combat, but has skill as a strategist. Naturally, this only makes things more suspicious, though the Shepherds don’t have long to ponder on it before a group of the undead emerge from a portal. A mysterious swordsman joins the fray, referring to himself only as Marth, and explains that these things are called Risen, and are merely a prologue for darker things to come. Sounds real original, right? Yet, as battles play out and wars are fought, you can’t help but become swept up in the narrative. Especially since some of the more interesting content happens on the side. Characters that fight side by side in battle will raise a support rating, with the highest being S rank. With each rise in support rank, the characters will have conversations on the side that you can view that not only explores the personalities of those involved, but builds camaraderie between them. If you manage to get them to S rank, the characters will marry, leading to children that not only can be recruited via optional missions later on in the game, but share statistical traits with the parents. One of the menus on the main map even lets you peek in on them in the barracks, leading to characters either wandering around talking to themselves, finding dropped items, or improving their relationships with others. Fire Emblem: Awakening looks quite good, even if it does have its… quirks. The movies that play during the game in particular are breathtaking, making it hard to distinguish if they’re CGI or animated. In either case, it’s a perfect art style for the game, and one I’d love to see replicated. The visuals you see during battle are more on the simplistic side, as every unit is represented by a tiny sprite and it’s hard to notice the field of battle when there are blue and red grids constantly being overlayed on it. When units engage one another, you get to see a skirmish with much more impressive character models and animations, though you do notice one glaring flaw: none of these characters have any feet. It’s not a big deal, and you really don’t notice it at first when they’re firmly planted on the ground, but the moment they get knocked in the air it looks like they’ve been moving about on stumps this whole time. I suspect shoes are cheap in the Fire Emblem universe. The game lends itself well to the 3D effect, though it kinda goes without saying, as Nintendo is one of the few publishers I’ve noticed can really use the technology effectively. The overhead view of the map creates a nice sense of depth, and the combat skirmishes are especially impressive. Even the movies can be viewed with the effect on. Purists will be excited to know that both the English and Japanese language tracks were included in this release, though there isn’t a load of talking to start with. The movies are fully voiced, with the occasional line of dialogue uttered here and there. The story is told using mostly portraits and text boxes, so you’ll end up reading most of what’s going on rather than having it read to you. It’s kinda like The Legend of Zelda titles, in that characters make random sounds or say random things when you engage them. I’m okay with this, as I can read faster than the characters can speak their lines anyway. That being said, the English dub is very good if you decide to keep that on. The soundtrack is so well composed, it’s a shame that there wasn’t a soundtrack offered as a pre-order bonus. Some of the more common tunes, such as the main theme and the level-up jingle, have made the transition here. Many of the sound effects were also carried over, such as inflicting damage or the little ting noises from gaining stats. It’s like comfort food for the ears. If you’ve never played a Fire Emblem game before, it shares a lot in common with games like Shining Force or Final Fantasy Tactics. You and the opposing faction each have a party of troops of varying classes and levels. Selecting one will cause the ground to turn either blue or red, with the former indicating where you can move and the latter being your attack range. The player always gets to move all of their troops first, and at the end of their turn, the enemy does the same. Engaging another soldier will show a short scene of them inflicting damage, or healing, or whatever it is you commanded them to do. The franchise operates on a rock-paper-scissors mechanic that is still present here. So for example, a soldier wielding swords will have an advantage over axes, but will be weak to spears. You can still deal damage to enemies you’re weak against, but the likelihood that you’ll land the blow is lessened severely, and since they can counter attack, you could wind up dead if you don’t land the hit. Most of the action takes place on the top screen, though highlighting a unit will display some useful information on the bottom screen. Things such as the current weapons and items someone is holding, for example, can help plan your next move, since certain classes can wield multiple weapon types. It’ll also display their stats and their current level at a glance, so you’ll always know who will need the next level gain. The support rating between units is far more significant now than in previous titles. As you fight enemies side by side with your comrades, their support rating will go up, and at higher ranks will trigger bonuses for fighting next to one another. Not only will units gain stat boosts, but the second party member will appear in skirmishes and may block attacks or land additional attacks of their own. Weaker units can be paired up with stronger ones if they find themselves in a hopeless situation, or if you just want to provide a boost to the host unit. It’s also a good way to build up their support rating if you’re trying to inspire love amongst specific teammates. While the game still progresses in a linear fashion, you now have access to a world map that will allow you to revisit areas. As you move about the map, you may see enemy units that you can engage in skirmishes with, should you wish to build up your character levels, as well as shops you can buy new items from. Expect to make a lot of trips around the map looking for weapons you need, as most every one has a limited number of uses and will eventually break. There is an option to forge weapons using your extra cash, though given the rate at which they break, I never bothered with it. Your characters’ levels will cap out at twenty (with a few exceptions), though with the help of items found in battle or in shops, they can class change. In doing so, you get a choice as to what they become, as well as gain a load of stat boosts appropriate to the chosen class. In fact, they can class change as early as level ten should you choose to do so. After the change, they drop back down to level one, but will maintain stat gains and skills from before giving them a new class. Fire Emblem: Awakening has StreetPass and SpotPass functionality that will send parties from other players you meet into your world that you can battle with to earn items. There are also characters and items from previous Fire Emblem games that will download to your game periodically that you can also challenge and recruit for a fee. A co-op mode exists where two players can pit three of their best in a duel against a line-up of CPU units. I had high hopes for this mode, but considering there were no strategic options and all it consists of is trading blows until the other units are dead, I was a little disappointed. The games were never exactly multiplayer focused, so it was all just icing on the cake for me. Still, having multiple armies ally against a massive A.I. controlled battalion would’ve been awesome. Depending on the difficulty level you choose, you can probably get through the main story in around thirty hours. Outside of the core chapters, there exist “paralogue” chapters that can be unlocked, depending on the romantic choices you make throughout the game. These exist almost purely to recruit new characters, which is honestly the best reward you can ask of in a sidequest. If that’s not enough, there is a node on the map that will open up after Chapter Four and gain you entry to DLC content. New maps are released regularly, with the first being free for a limited time. These give you an opportunity to fight a battle against heroes of Fire Emblem games past and gain some of them for your own team. I was a little perplexed that this content can’t be downloaded outside of the game. These maps show up on the Nintendo eShop, but choosing to download them only launches the game. I had no idea what was going on until I realized that the content can only be downloaded within the game, but only after I completed Chapter Four. This was kind of a mess in the design. One of the things that creates a barrier of entry for the Fire Emblem franchise is the existence of permanent death for your characters. 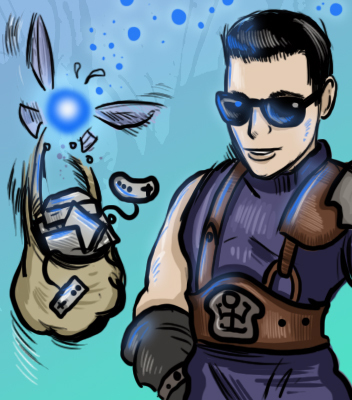 To its credit, it is certainly effective in cementing attachment to your characters, as a misplaced critical hit could potentially send one of your best units into the afterlife, never to be heard from again for the remainder of the game. On the other hand, it causes a great deal of stress and a lot of restarted chapters. I was always ambivalent towards the whole concept, as I treated as a means to an end, something I just dealt with because I enjoyed the core game so much. Well, now you can turn this off, and by doing so, a fatal blow will just knock a party member out until the next fight. There are also multiple difficulty levels, though there seems to be a large disparity between the normal and hard difficulties. Normal feels too easy in a lot of cases, while hard is incredibly punishing, even in the early going. There’s also a difficulty called Lunatic, which is what you are if you decide to choose that one for your first playthrough. 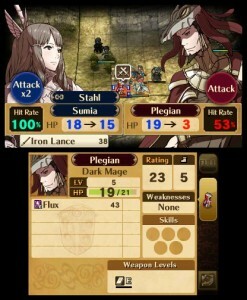 Regardless, there’s something for everyone, making this the most accessible Fire Emblem game yet. After one of the weirdest localization backstories ever told, followed by a lengthy shipping delay, Fire Emblem: Awakening finally graces the Nintendo 3DS console. Chrom and company look great in 3D, in all their feet-less glory, and the movie sequences are some of the most impressive I’ve seen thus far on the system. Classic songs and sound effects are all present, as well as a nicely done dub, though the Japanese language track is present for those that prefer that. The story skirts dangerously close to archetype territory, but the unique and well written characters carry the plot, and their numerous exchanges will have you experimenting with the various pairings for hours on end. 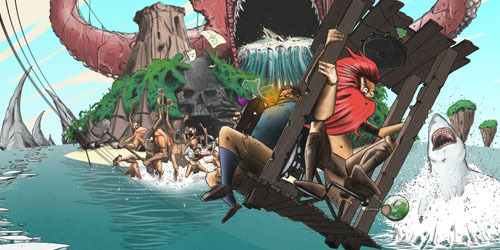 Being able to marry party members and bear children was a fantastic addition, and having the ability to turn permanent death off for the first time in an English release poises this as the most newcomer friendly entry in the franchise. How fortunate then, that this is also one of the best, if not THE best entry as well. With great characters, engaging battles, and quality DLC that manages to incorporate the series’ past, Fire Emblem: Awakening is one of the best 3DS games I’ve had the pleasure of experiencing, and the year is just getting started. It’s a great game and makes me hopeful that the next games are as good and come to the States. I feel this is hands down the best game in the series. I’m playing it concurrently with Shining Force iOS and having a ball with both. I’m shocked, Alex. I thought you didn’t like Fire Emblem games? I generally don’t. I find the plots dull and the mechanics subpar to most other SRPGs, but they knocked it out of the park this time.